“And so, we have provoked the siege of the fortress of Birtham.” – said Marasura. “Well pardon me! Sequentiality does not imply causality! We will present the story differently.” – responded Burzasp. “We have seen the lady – and this is the story we will be telling.” – Santiago concluded. However, everyone was adamant that they wanted to offer further help. Surgat nodded and ordered his underlings to bring them their rewards for the task already accomplished: 400 gp, a holy symbol of Karttekeza (which Santiago hung around his neck), two ancient and dusty vials filled with holy water, two healing potions, a magical scroll with Dispel Paralysis, and three doses of hydrocreator dust. At the caravanserai, they encountered a short fellow in a turban with cropped beard and a scimitar, and he immediately caught Santiago’s attention. “I tore this thing off of one single-handedly.” – Marasura displayed the weird bit of metal machinery from Tridentfish Island. “And this is from an ape demon!” – Santiago brandished the tooth of a winged ape. Rustem was not impressed. Finally, after a lot more wine, they tested the newcomer out in the courtyard by placing a clay pot on a pole. Rustem took aim from a distance and smashed it with a single shot [rolling a critical hit]. 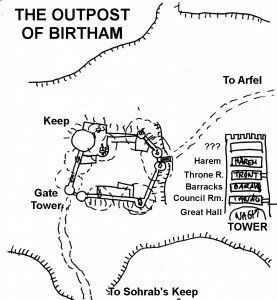 The way back to Birtham passed without problems, although they met, and later bypassed a caravan lead by a merchant named Ram Golab, in the company of 25 mounted soliders. He first heard the news of siege and undead with scepticism, then alarm: this was his usual route, and he was also a friend of Birtham’s master, Kuraddin Mirza – whom he had seen riding in the direction of Arfel, but could not bring to stop no matter how he and his men shouted. He agreed that he would wait on the road until he received news from the returning party, and made camp. They rode on towards Birtham’s gates, staying well out of sight to assess the current situation. The walls were standing, although there were signs of struggle. Poles rose on the stones, and upon them were impaled corpses. 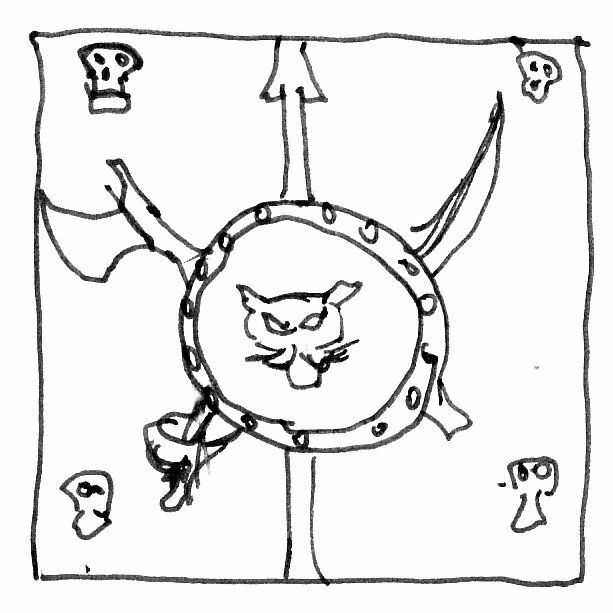 A banner showing a tiger’s head superimposed on a shield surrounded by skulls and various weapons fluttered on the top of the main tower. Sunset was approaching. “Well, damn.” – someone said. “We have an expendable merchant” – Ambrosius mused, to be shouted down by the others. The group hatched more plans as night fell, and pyres were lit atop the walls. The occupiers were patrolling all around the walls. Why did Kuraddin Mirza ride from the fort? Was he fleeing to raise the alarm, or was he under a charm? Marasura suggested that since Ram Golab had met him, but they hadn’t, he must have been avoiding Arfel and heading straight towards the City of Vultures. Finally, a plan was prepared. Choosing the opposite side of the keep – which seemed less watched – they tied their horses, and an invisible Burzasp scaled the walls with a coil of rope, while another snaked up by its own with Vifranavaz’s Unseen Servant spell, followed by Rustem. The battlements were still walked by the defenders, and Rustem saw they were all of the undead. They snuck across the wall walk, and dropped another rope down to the courtyard. A skeleton approached. Rustem cocked his crossbow and shot… but rolled a critical fumble, and hit Burzasp, who rolled a critical fumble on his saving throw and let out a mighty yell. Skeletons streamed from the bastion and the central keep! Ambrosius and Marasura leaped upon the ropes, climbing swiftly to help relieve their comrades! Waves after waves of attackers came, until the party had to retreat into the southern bastion, where at last they could shut the door, and bandage their wounds among abandoned bunks and the large wooden winches of the south-western gate. The dead were battering down the door, while horns wailed and drums banged in the central keep. While Santiago, Burzasp and Rustem prepared themselves to open the doors and strike out at the undead, Ambrosius poured lamp oil on the dry wood, and hacked apart the gate mechanism until it was irreparable. When all was done, they forced their way back on the wall, against the skeletal horde, and one by one, dropped and jumped down the ropes to the dark ground outside, where the horses waited. The next dawn, Ram Golab the Merchant once more received the travellers, who had brought the bad news: Birtham was, without question, ruled by the undead. Burzasp recommended that he rush at once to the Citadel of the She-Sultan, and prepared a short message for the eyes of Surgat, warning him of the situation, and Kuraddin Mirza’s possible treachery, but also that they would persist in trying to save the captive swordswoman. At night, they made camp on the southern plateau overlooking the dusty basin and the frontier fort. All was still, until there was a horrible growl from the direction of the horses, and the roar of a pack of lions which had attacked their mounts. The attack was swift, and the adventurers did not dare intervene. After the predators had left, they saw that two mules had been killed and devoured, but at least the horses had been able to escape – and they were found grazing next day. Exhausted, they watched as a procession of riders bearing banners left Birtham through the eastern gate, then circled to the west. The tiger banner from the tower was gone: Sohrab Khan and his company were out on the hunt. Resting a day, Ambrosius and Marasura hatched a more subtle, if desperate plan. They made preparations, and at night, crept back towards the walls. The burnt out gate tower was now abandoned, and they could climb back in uninterrupted. They paced the length of the wall towards the keep, and distracted the guards with thrown rocks. As the skeletons – who were not the brightest – went to investigate, they snuck in through the door. Stairs lead down to a common room and up the tower. This was familiar territory, and they continued upwards, until they were standing in Kuraddin Mirza’s deserted reception room. The chess table stood next to the mirza’s wooden chair, lit by moon rays through a single open window. There was only one way forward, through a locked brass door, which proved no challenge. The pair stalked up the stairs, entering a suite full of gauze veils, cushions and perfumed bowls of water. This was where Kuraddin Mirza had kept his wives: but while there were four women in the harem, none of them were Gulafshan Zer, and all looked dazed and out of their minds, apparently enthralled by the vampire lord’s magic. Another door was locked and beyond their means to pick. They returned where they came, leaving behind the keep. “The lady isn’t here, because she has been returned to the other keep while we were away reporting to the Citadel” –Burzasp suggested a possibility. “Or she is free, and in neither castle” – countered Santiago. Original date 3 June 2012. Referee’s Notes: This was the one and only appearance of Rustem, who disappeared as silently as he came. 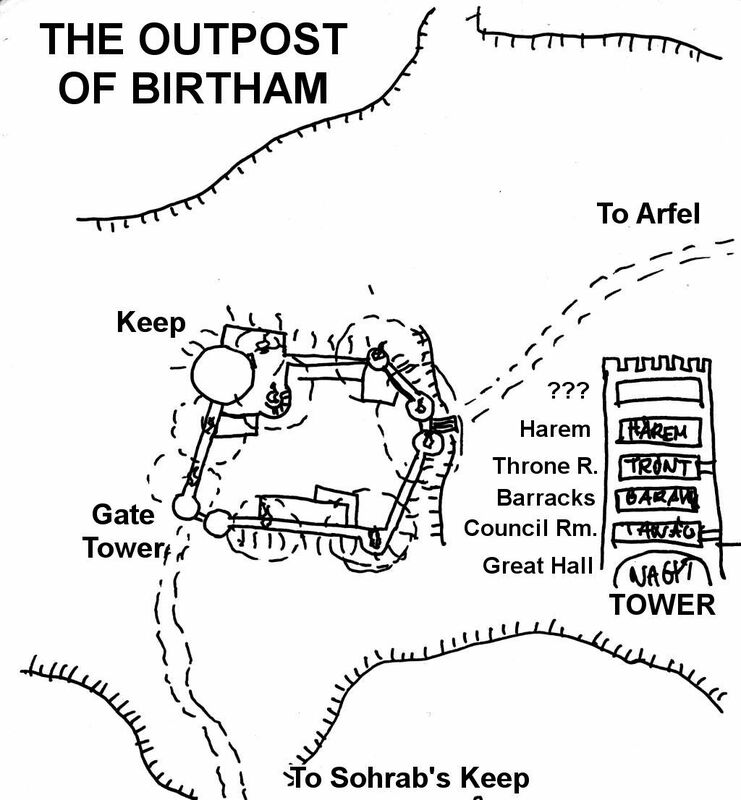 This was also the session where the party’s planned surgical strike against Sohrab Khan started to evolve into a minor war with a lot of heroism (fighting off 40 skeletons atop the battlements of an enemy keep is no small feat), but also setbacks and false leads – and all due to two failed rolls.